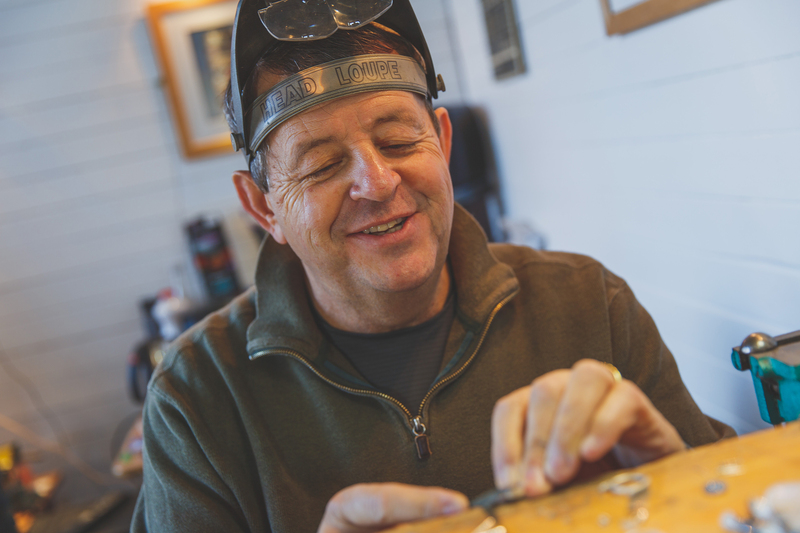 Peter Reeves specialises in bespoke design and handmade jewellery in Plymouth, Devon. Peter Reeves has been creating carefully crafted jewellery for nearly 20 years, having studied jewellery courses, and graduating in Gemology at the Plymouth College of Art & Design. Influenced by clean lines and strong forms, Peter Reeves is one of Plymouth's leading jewellery makers, marketing pieces through local galleries and National Trust properties. Peter Reeves Jewellery works with you to bring your dream pieces to life. Peter Reeves Jewellery regularly holds jewellery workshops where you design and craft your own piece of jewellery. After the workshop, you leave with a unique piece, and keep as a memory of your experience of hand-crafting. Cherish your jewellery for years to come with the knowledge that yours is an innovatively designed and originally created one-off piece. Peter creates individual jewellery not seen on the high st. This gives you the freedom to have as much or as little creative input as you like. Contact us today for stunning handmade jewellery designed by you, with you in mind in Devon. Visit: Dame Hannah Rogers Trust, Azure Gallery, Cotehele National Trust Gallery.